Kristin Ellis has been a jewelry artist for more than 20 years. She brings her inner vision to life, creating one-of-a-kind original jewelry from reclaimed metals, with an emphasis on sterling silver and copper alloys. 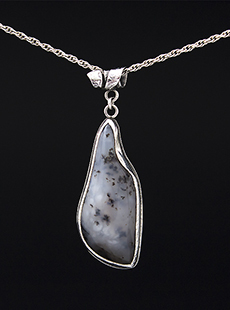 Kristin designs and polishes many of the gemstones in her work. Natural crystals and earthy agates figure prominently in her rings and pendants. You may encounter found objects alongside rare and precious stones. Kristin uses a distinctive blend of silversmithing, lost wax casting, lapidary, and enameling techniques in her Victorian studio near the old train depot in Galion, Ohio. Kristin has studied art and sculpture at San Antonio College, The Southwest School of Art, and Trinity University in Texas. She apprenticed under jeweler Robert Hinds and studied with the Gemological Institute of America. She has exhibited her work widely at galleries and fine art festivals around the country.